Here’s a story about a boy and a bear…A boy walks into the woods and is confronted by a bear. He panics. His heart rate elevates. His body is on high alert and at that moment, sends a 911 message to get the hell out of dodge. Bad news is he poops his pants. Good news is he survived. Moral of the story…Bring clean shorts with you because you never know when you might encounter a bear. Next is a story about a young pitcher who spent the entire off-season away from bears, instead he was constantly…. And before you knew it, his velocity jumped. His confidence soared and he was prepared for anything. But, this young man left something off his training schedule that’s going to haunt him. And to be honest, it wasn’t his fault. After all, you don’t know what you don’t know. We’re all short on time and most coaches understand how important the physical side is to higher performance. And there’s some coaches really advanced. Because they realize this game is played from the neck-up. So, the time comes for the young man to show the world what he can do. But, it doesn’t work out as planned. to make a long story short, the poor boy melted like lava. He choked. And it was crazy to watch how quickly his velocity dropped once he stepped into a real game situation. All the off-season training was for nothing. There wasn’t a bear anywhere to be found. What happened? Why did his velocity drop? Why did his digestive tract flood his Fruit of the Looms? Why did he melt like lava? Do you want the truth? I’m not sure if you can handle the truth. The human body is a system – Everything affects everything. 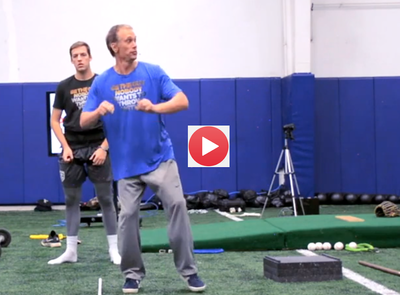 Your velocity, command, arm stress is dependent upon something we call the nervous system. The nervous system controls the messages being sent back and forth from the brain to the body and body to the brain. And just like our boy who encountered the bear in the woods, the body was forced to make a choice. And the same goes for pitchers. You see, the body can’t differentiate between physical stress and emotional stress. The body is paranoid. Thank our ancestors and the saber tooth tiger. They had to be. The body’s #1 goal is to protect itself.Sadly, as smart and complex as the body is, it doesn’t know the difference between a bear running at you full speed or a 2-0 count with bases loaded. The body’s going to respond to the feedback provided through breathing patterns. Anxiety increases heart rate and blood pressure. And those are just two of the many feedback mechanisms the body uses to shat, or pitch. Cause when it comes time to fight or flight, the body’s going to either send blood flow to the distal segments or the digestive tract. So, whenever your body senses a threat, it’s going to make it’s own decisions based on the information being supplied to it. What it sees affects where it goes. What it hears affects how it moves. What it FEELs affects how it responds. But, luckily for you, there’s an easy way to train it. All the weight training and long tossing, crow hops, and bullpen work, does you no good. It’s a waste of time if you can’t breathe. Hard to believe in this day and age, coaches don’t realize that. Crazy to believe coaches talk the mental game but don’t practice breathing. And the only person really benefitting from this broken reality is the orthopedic surgeons and underwear manufacturers. So, here’s what I’ve done. I’ve put together a breathing exercise that you can apply right now. And I’ve got to thank the legendary Alan Jaeger. Last year at Pitch-a-Palooza Alan gathered close to 75 coaches and taught us a breathing exercise that blew me away. We use it daily. By now, you all know how I preach FEEL. And that’s just one reason why this exercise is perfect for our system. But, it’s great for anyone and I can’t stress to all you coaches out there, how important Breathing is to higher levels of performance. Breathing is THE BRIDGE that binds the brain to the body! #1: Watch this video and apply it with your players. It doesn’t require a baseball and it’s something your pitchers could instantly benefit from to become a better pitcher. #2: Spend time studying the work of @Jagersports, Alan Jaeger. He’s one of the first guys I call to talk pitching and the man is a game-changer. I’m lucky to have this guy in my corner and on my speed dial. #3: Spend $2.95 to remind yourself to breathe… Just imagine how much this will save you in replacement boxers?!? Alright, here’s your chance to tell the Underwear manufacturers you don’t need an extra pair… Cause you’re prepared, you ain’t afraid of no bears. Enjoy this video and be sure to share this post.